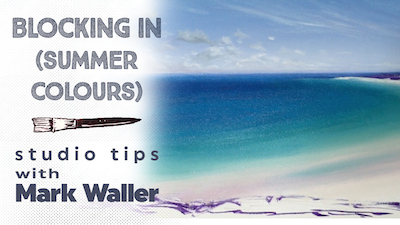 Acrylics Anonymous, Issue #054 -- Summer Lovin’ Colour. We decided to film a “short” blocking in sequence just for you - it still ended up longer than intended but we hope you enjoy it nevertheless! To get the illusion of lovely bright clear skies, contrast is your friend. 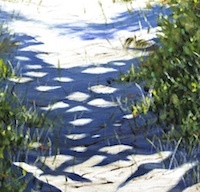 Don’t be scared to make your shadows dark, and your highlights light for added drama. Try using pure, slightly unexpected colour in your shadows like blues and purples on sand, and the whitest whites for your highlights. Don’t be afraid. It’ll be all White in the end. (groannnn). We are looking at the possibility of selling paint supplies direct to you and need your feedback for this to happen! Click here for our 2 question survey. In our continuing interview series, this time the spotlight is on Aussie artist Linda MacAulay - and a fascinating insight into her process. This month we’re focussed on artist Jan Rasiewicz, from Ljubljana, Slovenia, Europian Union, with his painting, “Listen To Ocean”. Jan has done an amazing job capturing the late afternoon summertime vibe in this painting. Great work Jan!! Jake Parker’s mantra “finished, not perfect” is something we can all take on board, no matter our arts practise. I know I have several (hundred) unfinished projects just in one room of my house! Thanks Jake. Click here for Jake’s advice on this. The Vintage Calendar Girls are a group of lovely ladies raising much needed funds for rare cancers. They sell calendars and will have their annual gala dinner in October. Check out the facebook page for more info. This lovely summery piece comes from Susan Sullivan from Manitoba, Canada; a long time supporter of ours, who first featured in AA in November 2014. 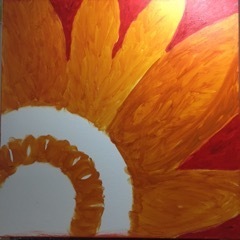 "I painted this Sunflower to donate to the Walk of Hope held here in Manitoba to support Ovarian Cancer. Their logo is a yellow sunflower that grows huge crops here in Manitoba. Their signature color is teal. 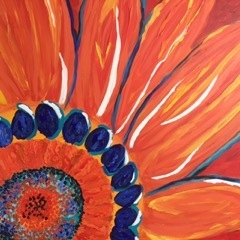 There is an orange sunflower, and many other colors. Sunflowers as you may know, face the sun at all times, as the sun moves during the day the flowers turn and physically follow the Sun. They’ve adopted this flower to represent eternal hope for healing and curing. I have a friend who is an Ovarian cancer survivor, four years now, and I wanted to give something meaningful to their fund raising. I had a very close friend who didn’t survive. I hope this painting is capable in helping them raise some funds. I took progress shots this time. 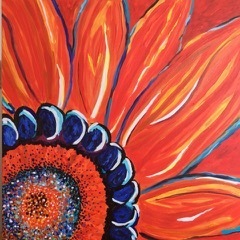 It is 24x24 inches, gallery wrap stretched canvas." 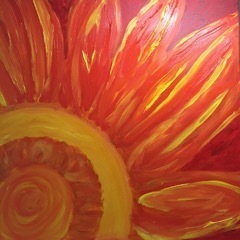 Thanks to Susan for sharing her inspirational artwork and story with us!